Good morning everyone! I have a sweet girl to introduce to you today! Meet....Mary.
" I am a wife and a mother of two handsome boys. I spend most of my time babysitting in my home and taking care of my family. I feel unqualified to write for this blog because I know very little about raising princesses. I only have boys and I am the only girl with five brothers in my family. I know my kids learn verses and hear Bible stories at church. Then we have devotions at home, but I know we have a long ways to go before we are teaching God’s commandments and statues to our children diligently. So I am looking for ways to incorporate God’s word into our lives throughout the day. This is the project we worked on today. We worked on our pre kindergarten skills and made a memory verse banner. 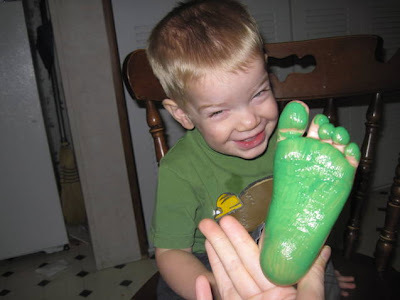 Joel loved having his feet painted. He said it felt "tickley". This is the first time James let me paint his feet. Joel always has to get his lips involved when he's working. putting on the finishing touches! proudly displaying the finished project. I would love to hear ideas from others as to how your incorporate Scripture verses in your everyday life. Also I'm looking to buy or make framed Scripture verses for my house. Let me know, if you know, of any great websites for this." Thanks so much, Mary. 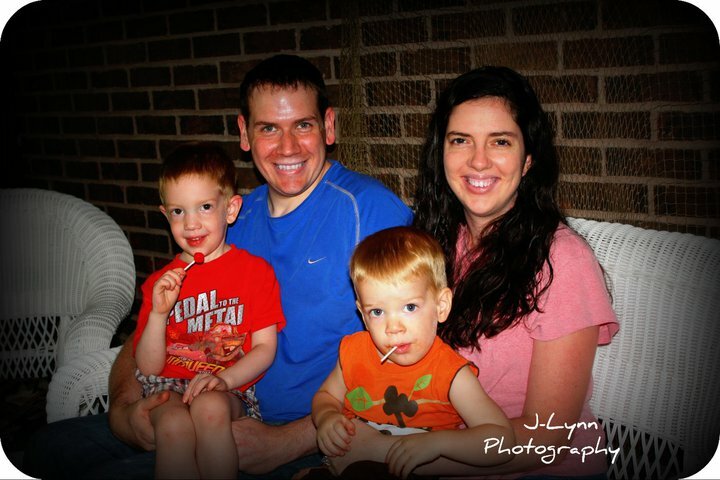 You're a great mom, this challenge is very convicting and inspiring to me! Such a precious post, Mary, and oh, so important to teach our children the scriptures. I love how you interacted with your kids to make that verse come to life. Way to go, girl! BTW, sweet Amy over at "Daily Pleasures" has KJV Scripture prints for sale... go check 'em out! (They are on her right sidebar). Love this post Mary! This is the most important thing we can teach our children! When we are learning the alphabet we learn a verse for each letter. But the most effective way (for my children at least) is through song. It is the biggest blessing to hear them in their rooms singing Scripture! It puts it in their head and their hearts. Keep up the great work! Thanks Jolene, Im going to check it out right now! Great idea! Love the banner! Definitely need to do something like this with my babies! Great challenge, Mary! We also have done the Scripture song thing. Seth has a little "radio" (brand called SweetPea) that you can download CD's onto. Then he can turn on his radio and play it anytime he wants. The CD's we got him are called Bible Songs for Kids. We order them from Majesty Music. They are KJV verses in song sung by children, and Seth plays those songs every single day! I think we all have them memorized by now! Thanks girls for the ideas. I can not wait to try them! !